Oils have been little bottles of moisturizing power in my arsenal for a few years now, but I never really thought much about them until the Josie Maran 100% Pure Argan Oil made it into my cabinet about a year ago. Harsh winter winds and weather often need more than a moisturizer to save the sensitive skin of your face, but I always found oils to be…well, oily. I would go to bed thinking I’d slide right off my pillow or get a big’ol grease stain on the bed so I avoided most oils with a 10ft pole. Yet after trying this wonderful bottle of Argan Oil I realized the full benefits and moisturizing potential of facial oils. Argan Oil was a long-kept cosmetic secret; a 100% pure and organic, chemical free oil originating from Morocco. The oil is extracted from a nut grown in hot arid climates and is full of vitamin E and fatty acids, which are combined to create amazing healing properties. The oil is great for your skin, hair, nails and is even a great natural remedy for nappy rash! The oil is amazing on the skin to protect from that harsh winter weather and give that extra boost of moisture needed. It slides on smooth and not too greasy, and sinks in fast. That’s the important part to me; no greasy oil-face after heading to bed. Smooth it on and it’s dry before you’re finished the rest of your bedtime rituals. It’s gentle enough for an everyday moisturizer, but also strong enough to help any rashes, eczema and other skin ailments as well. I’m so glad I added a few drops of this into my nightly routine to seal in my protective serums and moisturize my face for the Canadian winter. That’s all you need, just a few drops! 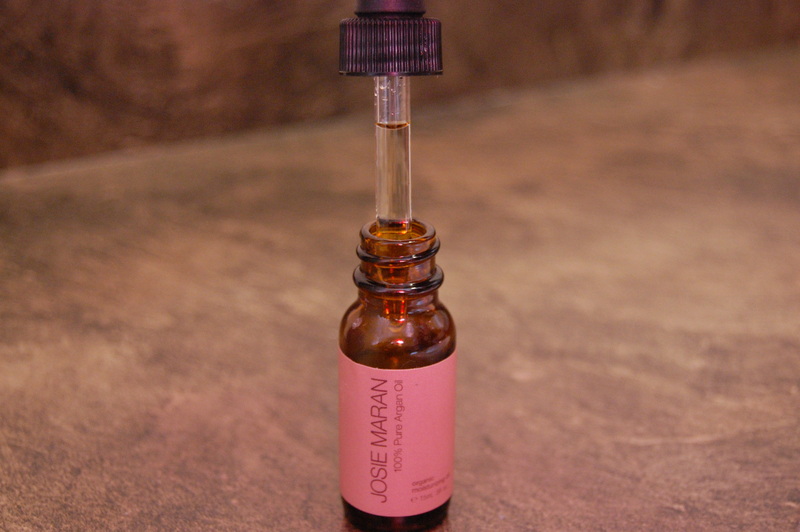 This is why I love the Josie Maran Argan Oil. Sure I can do that. I’ll post it within the next two weeks! Thanks for reading!